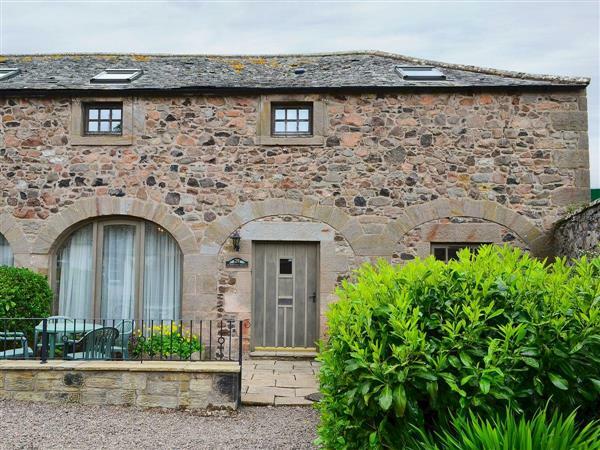 Aubretia Trail, Akeld Manor in Akeld, Wooler, Northumberland sleeps 4 people. Standing proudly at the foot of the Cheviot Hills, on the edge of the glorious Northumberland National Park and only 15 miles from the alternating sands and rocks of the coastline, Akeld Manor cottages offer the perfect setting for a holiday in England’s fascinating and beautiful Border country. The gracious Manor House and its cluster of cottages and mellow stone buildings have been sensitively renovated and converted to create an outstanding collection of holiday properties (refs MJB, MDW [Akeld Manor House], MED [Timberwick Green], MFO [Bizzie Lizzie Cottage], MGG [Lavender Cottage], MGH [Perriwinkle], MJC [Primula Patch], MJD [Freesia Cottage]) – all with shared use of a superb choice of facilities. A leisure building houses a wide range of amenities (available daily, all the year round) which include an indoor heated swimming pool with changing and shower facilities, a Jacuzzi and sauna. There is a well-equipped multi-gym, too, and the first floor of the building features a large games room (with pool table, table tennis and football game) and a separate snooker room with full-size antique table. The cottages are set in acres of shared grounds, which offer space for relaxing and for children to play, and they lie within 2 miles of the shops and inns at Wooler. The Northumberland National Park stretches south through Kielder and Wark Forests as far as Hadrian’s Wall, and north to the Scottish border. Long stretches of sand can be found lining the coast south of Berwick-upon-Tweed (16 miles). At Beal (13 miles), the road to Holy Island runs gently down to the shore, where it becomes a causeway covered and impassable at high tide. These quaint cottages, some of which have originally been cartsheds and byres are charmingly set in small groups within the spacious and colourful grounds. The large Manor House (which provides accommodation for parties of 15), also has a splendid large walled garden allowing total privacy. The setting of these cosy cottages is intriguing, many with small courtyards and gardens, a truly interesting and imaginative conversion full of detail and character – the individual and tasteful interiors are delightful. Shops 2 miles. A gracious manor and cottages of mellow stone . . . between history-steeped hills and a coast of golden sands . . . This property has been tastefully converted from a former stable block. Open-plan living/dining-room with modern fitted kitchen area. Bathroom/W.C. First floor: Double bedroom with en-suite shower room. Twin-bedded room. For a better idea of where Aubretia Trail is, you can see Aubretia Trail on the map below. Aubretia Trail is in Northumberland; should you be on the lookout for a special offer, you can find all the special offers in Northumberland. It's always worth checking to see what is on offer at the moment. Do you want to holiday near Aubretia Trail (MJB), you can see other cottages within 25 miles of Aubretia Trail; have a look to find your perfect holiday location.